To read original article on wsj.com click here. Tommy McAlinden is a sober companion. ~a friend for hire catering to alcoholics and other addicts in early recovery. Mr. McAlinden, a laid-back 48-year-old, covers his tattoos with preppy blue blazers and khakis. His first client, a 23-year-old from a prominent New York family, was referred by Williamsburg House, the upscale, $12,000-a-month private halfway house in Brooklyn that Mr. McAlinden managed after retiring from his job with the city. It turned out to be a typical case. Mr. McAlinden squired his charge around town for three months, taking him to lunch, recovery meetings and classes at NYU. Mr. McAlinden typically introduced himself as his client’s friend. At a private golf club, he switched roles. “The word ‘assistant’ goes a long way,” he says. Even more gratifying—five years later, the client is still clean. Not every case goes smoothly. Mr. McAlinden once spent a month living on the Connecticut estate of a retired hedge-fund director. They ran errands, played golf and went to recovery meetings. Mr. McAlinden, who tried feigning an interest in the markets, had a hard time getting through to his charge. “He was incredibly wealthy and very intelligent. Guys like that have a hard time admitting their life is in trouble,” he says. Six months later, the client was drinking again. Some clients even sneak around his watch. One hid pills in his leg cast. Another shoplifted cough syrup from the drugstore. Mr. McAlinden, who subjects his clients to urine tests and pat downs, says he understands—he has his own recovery story. He grew up drinking at Dooley’s, an Astoria bar where his dad worked as a bartender. By his mid-20s he’d been arrested in a drunken brawl with a cabbie and threatened with the loss of his job. Rehab didn’t work. It wasn’t until 1994 that he met a solid mentor at a recovery meeting and got sober for good. “I just needed some guidance, I couldn’t do it by myself.” he says. 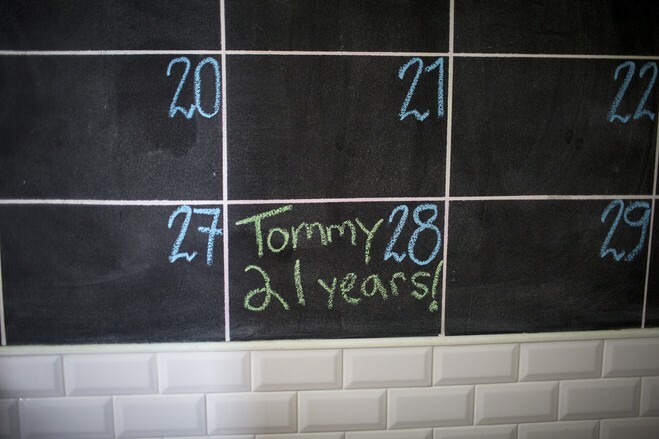 Tommy McAlinden’s sober anniversary is posted on a calendar. Now, he tries to lead by example. “The things my clients do to retain recovery, I still need to do myself,” he says. That means attending recovery meetings and leading what he calls “a spiritual way of life” despite the challenges of city living. “I have to practice patience, tolerance, kindness and service to others,” he says. Sober companionship is a fledgling field. There are perhaps two dozen working in New York City, earning $500 to $1,500 a day, according to Mr. McAlinden and Williamsburg House founder Joe Schrank. The demand is clear: Wealthy folks from around the globe jump at the chance to get sober in the Big Apple. Whether the service helps long-term is another question. There aren’t any published studies gauging its efficacy, says Emily Feinstein, director of health law and policy at the National Center on Addiction and Substance Abuse at Columbia University. Nor are there any regulations associated with the profession. Sober companion is a title open to anyone. Some of Mr. McAlinden’s clients credit him for their recovery. Hayden Brown, a 17-year-old high school senior, says that while living at a private sober house to treat his pot addiction last summer, he relapsed twice before Mr. McAlinden entered the picture. For two months, they bunked in the same room, attended meetings and went to hockey games. Mr. Brown says he hated losing his freedom, but the relationship taught him good habits. He watched Mr. McAlinden fulfill his commitments, participate in recovery groups and care for his 9-year-old daughter. “Tommy taught me to live a sober life,” says Mr. Brown. His mother, Mary Brown, says neither she nor her husband had experience with addiction; they needed a veteran to guide their son. “Tommy was a person who’s been through the woods and knows how hard it is,” she says. Another client, a film director who asked to remain anonymous, said he happily pays McAlinden $1,000 a day to accompany him at film festivals around the country. With a sober companion by his side, he’s never dogged by the question of whether to drink at alcohol-fueled cocktail parties. June 29, 2015 – /PressAdvantage/ – Thomas McAlinden, founder and president of Sober Companion NYC is set to expand his network of sober companion services, extending their vital services further away from their operational center in New York. With the increase in number of U.S. citizens becoming dependent on tobacco, alcohol and other illicit substances every year, the resulting costs in health care, rehabilitation, crime and loss of productivity nears $1 trillion, according to a latest study. Sober Companion provides a supporting role to people who wish to overcome their addiction. These roles can range from travel support to round the clock companion support depending upon the individual needs and obligations of a client. According to the National Council on Alcoholism and Drug Dependence, nearly 19 million citizens are dependent on alcohol. In addition to this, more than 24 million people in the U.S. are regular users of illicit drugs as estimated by the National Institute on Drug Abuse. This amounts to a huge portion of the population and affects people from all walks of life from all backgrounds, leading to a variety of treatment routes and methods being developed and evolving to cope with a multitude of lifestyles. According to published figures, nearly 50% of people dealing with addiction suffer a lapse after receiving treatment. This is mainly faulted to a lack of support and guidance available to them after the conclusion of their treatment course. More statistics about drugs and their influence can be found on Sober Companion NYC’s website at sobercompanionnyc.com. People recovering are in greater danger of relapse compared to someone who has never been addicted before. This is where the role of a sober companion is most effective. The role of sober companions rose out of a need for someone who would act somewhere between a friend and an addiction therapist. Often former addicts themselves, sober companions have first-hand knowledge and experience in what a substance abuser would be going through. In this way, companions would able to develop dynamic recovery plans for their clients. These plans would differ from regular addiction therapy schedules as they are molded around the needs and nature of the client. These roles could range from providing support during traveling, visiting addiction seminars or various other instances during which a client would turn to their drug to cope with the situation.